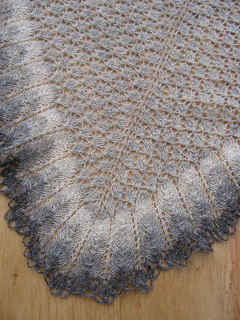 This simplified Icelandic shawl can be knit in one color or more, and four were used for the gray sample. It is knit from the top down in spider lace to a modified rose trellis lace edging that ends with a crocheted chain cast-off. 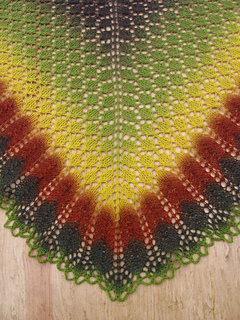 Color changes can be made anywhere, but the gray sample shows shaded color changes on the edging. Spider lace is easy to memorize since it repeats over 6 stitches and 4 rows. The edging can be started after any 4-row repeat, so it is simple to customize the size. 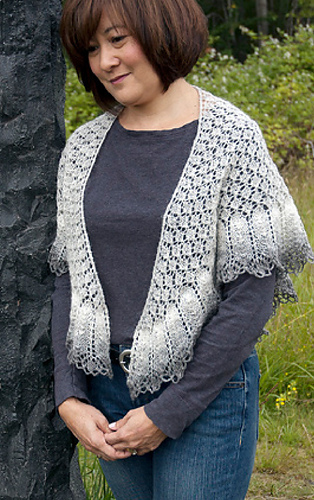 This shawl was named in honor of Sigridur Halldorsdottir, the author of the classic Icelandic shawl book, Thrihyrnur og Langsjol, and it originally appeared in the August 2011 issue of Knitting Traditions published by Interweave Press.